2nd Lieutenant (Acting Captain) Clement Robertson of The Queen's (Royal West Surrey Regiment) was attached to “A” Battalion of the Tank Corps when he carried out an act of gallantry for which he was awarded a posthumous Victoria Cross, the first one to be awarded to the Tank Corps. On 4th October 1917 he was involved in the British attack by 21st Division between Polygon Wood and the Menin Road. Four tanks were allotted to the 21st Division. Fire from German pillboxes caused heavy casualties to the British infantrymen as they advanced through the terrible muddy conditions of what had been the stream of the Polygonbeek. With the support of one of the tanks the German pillboxes were captured and the higher ground overlooking the Reutel valley was reached by the supporting British infantry battalions. Captain Robertson was 28 years old when he died. He was the son of Major John A Robertson (late of the Royal Artillery) and Mrs Frances O C Robertson from Delgany in County Wicklow, Ireland. He is believed to be buried in Oxford Road Cemetery in grave reference Plot III, Row F, Grave 7. 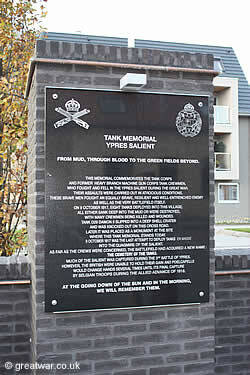 Tank Memorial Ypres Salient at Poelcappelle.